Taste test: These were triangular tortilla chips similar to Doritos (not corn chips like Fritos) but they had a different taste than any Doritos or Doritos competitors that I've tried. It was like the flavor of sun-dried tomatoes, and it was quite tasty. 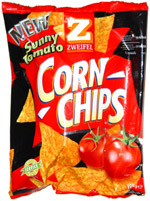 The chips also had a nice crispness that helped to bring out the flavor. Smell test: Tangy, might even smell a little like sundried tomato.